The act of mending is a personal and intimate action that takes me back to my first loves; needle, thread and cloth. Mending was once seen as a necessity across all cultures, today, some still find value in mending while others toss or cast the used aside to purchase something new. In a throw away society, many fail to recognize and understand the relationship we have with textiles, landscape and the built environment or understand their importance in our lives. 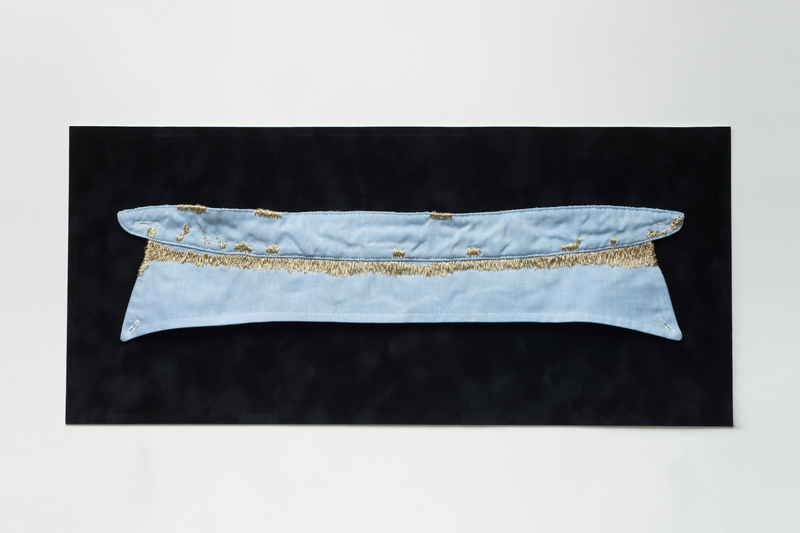 The task of mending allows me to pay close attention to the history of each textile; learning about its past rituals and how it protected the body or its performance within our homes. Highlighting the mended areas with a single gold thread, I am able to enhance the worn typography bringing attention to the individual story. Using gold thread was directly inspired by an ancient Japanese tradition of repairing broken pottery called Kintsugi; meaning golden joinery. The process celebrates the imperfections by adding beauty to the life of the piece of pottery. Just as the gold lacquer joined pieces of broken pottery, I too seek to find beauty in worn textiles, buildings and landscapes. Mending Gold: Cloth, Architecture & Landscape is a series of work that expands across our daily lives not only in textiles but also to our environments and buildings that surround us in our daily lives.